Known as the birthstone for November, the Topaz mineral is colorless and transparent although there are some topaz with different colors such as yellow, blue brown, reddish orange and wine color. Recent advancement in technology also made it possible to have coloured topaz ranging from pink, green and blue. Treated brown topaz can turn into violet, pink and sometimes yellow gold stones. Topaz is one of the most important gemstone in ancient times and ranked 8th in the Mohs Scale in terms of hardness. One of the most expensive type of topaz gemstone is the one called "Imperial Topaz". The stone comes from the golden yellow type and is one of the most expensive because of its rarity and color vibrancy which is rather rare for the stone type. The stone is harvested from countries such as Russia, Brazil and Pakistan. The next type of topaz stone is the blue topaz which is common in Scotland and Northern part of Ireland. The blue topaz is rare therefore most of the blue topaz in the market today are enhanced colorless topaz stone which are treated to change its color. The Champagne colored topaz are found in Mxico and favored because of its natural brown coloring whereas another variety, the "pink topaz", like the imperial topaz are rare as such, pink ones in the market are often enhanced stones as well. In buying topaz, it is common to see blemishes in the stone. Popular stone color would include blue topazes although yellow are also common. 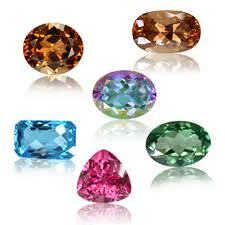 Expensive topaz stones would be ones in pink and ones with reddish hues. Topazes are also transparent to translucent in terms of clarity so one can see the inside of the stone. The cut most advantageous to the stone would be the step cut or scissor cut as to better reflect the light. For topaz stone that have weak colors, the cut most popular is the brilliant cut. Most of the topaz stones comes from Brazil although there are other mine deposits that are rich in the gemstone including Russia, Pakistan, US, Ireland and Scotland. These stones are mined and then sent to major jewellery companies for polishing before being sent out to jewellery stores around the world. Want to learn more about topaz or other gemstones? Feel free to navigate around our sites to see the latest designs and styles.